Once, long ago, Agee emerged in my imagination as a literary saint of rather catholic imperfection, who could render into words the impossibility of life, who himself embodied in his own raw childlike tenderness a daring to the world: take me, I don’t care, eat me alive, but listen first, listen long enough to hear. He is 28 when he writes that letter to Father Flye, originally his history teacher at St. Andrew’s boarding school in the Tennessee Appalachians, as he is trying to emotionally and intellectually digest the eight weeks he’d spent in 1936, along with the photographer Walker Evans, observing the lives of three Alabama sharecropper families. His editors at Fortune have rejected the 30,000-word essay he delivered. Could it make instead a book? He dreams it, yet he can’t trust the dream. He’d have to quit Fortune, otherwise would he ever have time to write? He’d have to get out of New York. As he’s writing this, in 1938, Agee composes another letter to Father Flye from Frenchtown, “I feel more shaken, confused, and ignorant, through my own actions, than I can remember having felt before…I cannot know for sure what I am doing, or why, or at all surely the difference between right and wrong…” Agee’s confusion is mine; it’s yours too, I think. Or rather, I think it ought to be. The most searching writing, even as it demands of us precision and particularity, derives its power from confusion, the willingness to be confused. This is Agee’s medium in the letters to Father Flye, which were collected and published originally in 1962, seven years after the author’s death. 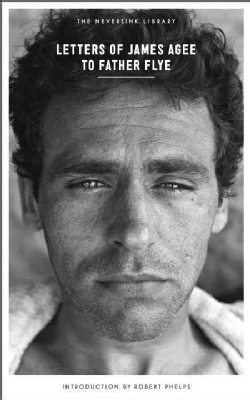 Now Melville House is reissuing the book, Letters of James Agee to Father Flye, complete with the original, moving biographical sketch by Robert Phelps, a cofounder of Grove Press. Despair comes naturally next, as night follows day, and just as relentlessly, to every writer of such erupting ambition. In Agee’s first letter from New York he mentions suicide; his own mortality patters the pages of the next 23 years’ of letters, stippling ink that grows, by the mid-1940s into a puddle: Agee is killing himself with alcohol and cigarettes. Agee doesn’t make it five years; when he dies, in 1955, at 45, in a taxi on the way to see his doctor, it has come too soon, and God knows it was preventable. Always stressed for time and money, he never gave his own work enough attention. He spent too long writing unsigned reports for Fortune and Time when he might have been pushing out more fiction (A Death in the Family, for which he posthumously won the Pulitzer Prize for fiction, was published in 1957). The conventional take on this is that it is a tragedy. But it isn’t truly so; this book of letters—for all it gives us of Agee, the man—is one reason why. The honesty is worth double the output. The letters themselves also remind us of his extraordinary range, tenacity, and prodigiousness.